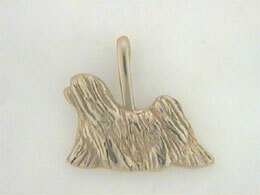 Perfect rendition of a Lhasa Apso walking on a leash or even showing! The Lhasa Apso is a sweet and docile breed of dog. The detail in this piece is amazing. You can almost see the dog walking! This piece has amazing movement and is sure to catch the eye of a Lhasa lover! Available in Sterling Silver below, or 14kt White Gold by Special Request.